I've always found that there is something so special about recieving an actual letter in the post (that isn't a bank statement). Now theres even more reason to love handwritten letters: Lanvin Stamps. 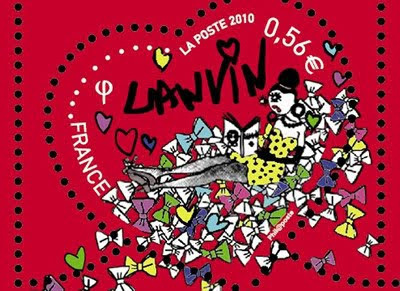 Thats right, Lanvin designer, Alber Elbaz, has designed to stamps, for the French, to celebrate Lanvin's 120th Anniversary. Alongside these stamps, you'll be able to get other comemorative items, such as pencils and notebooks. The stamps will be available to buy from early next year. I really am tempted to book a trip to Paris to get my hands on these. P.S. Leia was featured on Ella's blog carnival yesterday. Check it out here. Happy New Year Leia and Sherin! Love you girls. xoxo from Manila! I just love sending letters and cards also. I used to send my closest friends cards every single holiday, from Valentines day to Christmas. I fell off the wagon. These are so cute. And I am so jealous you can just book a trip to Paris so easy! Doing a lot of illustration myself, I really love the loose lines and bright colors. Looks like a really unique collection, and I never would have heard about this if you hadn't posted it! Ooh, I didn't know about this! Would love to get some when they come out, maybe I could go to France for a bit...! Fashionable stamps?? seriosuly, we're hooked. These little miracles are just so adorable, and the name Lavin is enough to have us runnning to the post office and writing pointless letters just to tack em onto. LOVE this post. 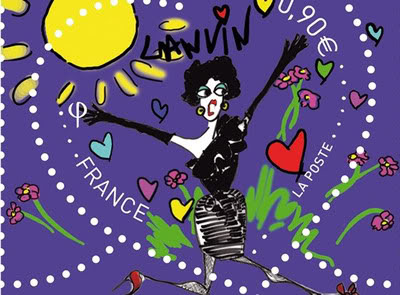 I've got my friend in France on the Lanvin stamp trail!! Soooo hoping she can get my some!! Lush lush LUSH!!! Those stamps are fabulous. Thanks for your comment. I wish you a HAPPY NEW YEAR. OOOOH I Love those stamps!! Happy New Year lovely!! so fun, i love them! makes me want to send letters! They have to be the most fabulous stamps ever! I adore snail mail, i really do and i would be tres excited if it had a lanvin stamp attached! I'm with you. I love mail too! These are so adorable. So much better than average stamps! I need to figure out a way to get my hands on these! I saw these at a store once along with pencils and the beautiful stationary. I was tempted to buy but it was sooooooooooooo expensive. Absolutely beautiful though.